Current flexible displays use a batch cookie cutter process for manufacturing. A new production method called Self-Aligned Imprint Lithography (SAIL) will streamline production and reduce cost. (PhysOrg.com) -- The Flexible Display Center, at Arizona State University, hopes to have flexible displays ready for test trials in approximately three years. 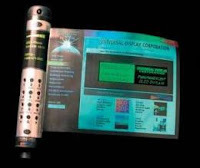 The possibilities of using flexible displays are endless and one day will be used in many portable devices such as e-readers, cell phones, and tablets. The people at hardware.info recently saw one of HP’s flexible screens rolled up and placed into a poster tube. HP’s CTO, Phil McKinney states that the flexible display is not designed to be rolled up. The display would only survive being rolled up about six times before it would start to malfunction. The screens are printed on flexible plastic sheets of Mylar material and could be easily rolled during the manufacturing process.